CBM has joined forces with Time To Change Global to launch a major new initiative to tackle stigma and discrimination around mental health in Africa and Asia. The new programme was launched today, on World Mental Health Day, at the Global Mental Health Summit in London, which has brought together health leaders from around the world. Mental health conditions like depression are a major cause of disability and ill-health worldwide, often leading to immense suffering. Those living in poverty are at greatest risk, often facing stigma and discrimination, and are least likely to access treatment. Through the major new programme announced today, Time to Change Global and CBM will work with local organisations and people with lived experience to promote understanding of mental health and challenge prejudice across the Commonwealth to combat mental health stigma. The campaigns will kick off next year with pilots in India, Kenya, Nigeria, Ghana and Uganda. The programme is supported by the Foreign and Commonwealth Office and Comic Relief. Time to Change, an anti-stigma campaign led by UK mental health charities Mind and Rethink Mental Illness, has seen significant change in attitudes to mental health in England and Wales since its launch in 2007. With funding from the Foreign and Commonwealth Office and Comic Relief, Time to Change Global will extend its focus to low and lower middle income Commonwealth countries, joining forces with CBM in this exciting new initiative. CBM is currently delivering mental health programmes in more than 25 low- and middle-income countries, tackling stigma, improving access to community-based support and providing psychological support to people affected by humanitarian crises. 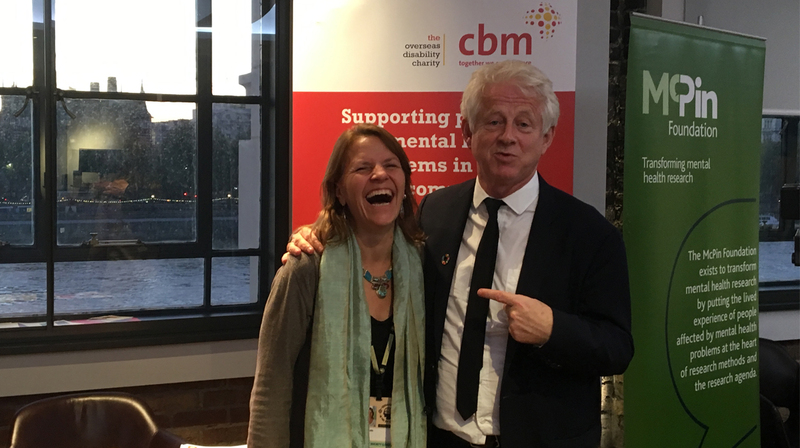 Images: Top - CBM UK CEO, Kirsty Smith and co-founder of Comic Relief, Richard Curtis at the Global Mental Health Summit in London. 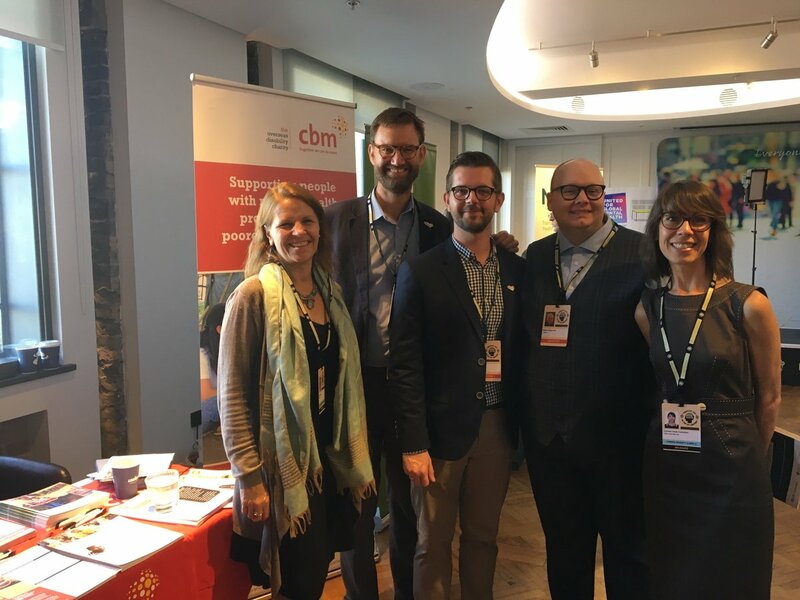 Middle - (l-r) Kirsty Smith, CBM UK CEO ; Julian Eaton, CBM Global Mental Health Advisor; Ben Adams, CBM Mental Health Programme Advisor; Martyn Illingworth, CBM Integration Director; Carmen Valle, CBM Global Mental Health Advisor. 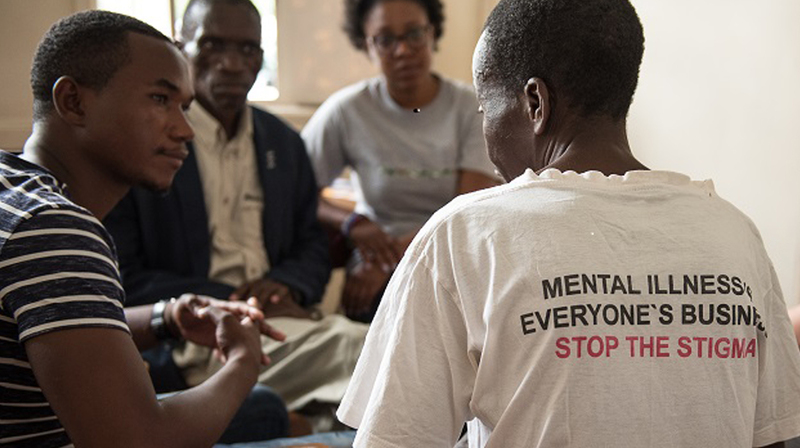 Bottom - Peer support group from CBM partner the Mental Health Users and Carers Association (MeHUCA) in Malawi.